The origins of Chinese cuisine can be traced back millennia. Chinese cuisine is extremely diverse with wide regional variations, and it is not uncommon for even Chinese people themselves to find the cuisine from another region to be completely foreign to them. Through the Chinese Empire, Chinese culture has influenced lands such as today's Mongolia and Vietnam. Chinese cuisine has for a long time been renowned in other Asian nations such as Korea and Japan. In modern times, the Chinese diaspora has spread Chinese cuisine to farther-flung parts of the world. That said, much of this has been adapted to local conditions, so you will often find dishes in overseas Chinese communities that cannot be found in China, or have been heavily modified from their original Chinese versions. Malaysia, Thailand, Vietnam and Singapore in particular are excellent places to sample such cuisine due to the long history of the Chinese communities there and the deliciousness of traditional local ingredients and cooking methods. Chinese cuisine can range from simple but hearty street food to over the top fine dining using only the most exclusive ingredients, with prices to match. Hong Kong is generally regarded to be the world's main centre of Chinese fine dining, though Singapore and Taipei are no slouch either, and the mainland Chinese cities of Shanghai and Beijing are also slowly but surely catching up. Chinese cuisine varies widely depending on what part of the country you're in. The "Four Great Cuisines" (四大菜系) are Sichuan (Chuan), Shandong (Lu), Guangdong (Cantonese/Yue), and Jiangsu (Huaiyang) cuisine, and other regions have their styles as well, with notably different culinary traditions in ethnic minority areas such as Tibet and Xinjiang. It's not hard to sample some of the regional cuisines in China even if you're far from their regions of origin—Sichuanese málà (麻辣) tingly-spicy food can be found all over, for instance, as can signs advertising Lanzhou noodles (兰州拉面, Lánzhōu lāmiàn). Similarly, although Peking duck (北京烤鸭) is ostensibly a local speciality of Beijing, it is also widely available in many Cantonese restaurants. The cuisines of Hong Kong and Macau are essentially similar to Guangdong cuisine, albeit with British and Portuguese influences respectively, while the cuisine of Taiwan is similar to that of Fujian, albeit with Japanese influences. That said, as many famous chefs fled mainland China for Hong Kong and Taiwan in the wake of the communist revolution, high-quality cuisine from different parts of China is available in those areas as well. Beijing (京菜 Jīng Cài ): home-style noodles and baozi (包子 bread buns), Peking Duck (北京烤鸭 Běijīng Kǎoyā), cabbage dishes, great pickles. Not fancy but can be great and satisfying. Imperial (宫廷菜 Gōngtíng Cài): the food of the late Qing court, made famous by the Empress Dowager Cixi, can be sampled at high-end specialized restaurants in Beijing. The cuisine combines elements of Manchu frontier food such as venison with unique exotica such as camel's paw, shark's fin and bird's nest. Cantonese / Guangzhou / Hong Kong (广东菜 Guǎngdōng Cài, 粤菜 Yuè Cài): the style most Western visitors are already familiar with to some extent. Not too spicy, the emphasis is on freshly cooked ingredients and seafood. Dim Sum (点心 Diǎnxīn), small snacks usually eaten for breakfast or lunch, are a highlight. That being said, authentic Cantonese cuisine is also among the most adventurous in China in terms of variety of ingredients as the Cantonese are famous, even among the Chinese, for their extremely wide definition of what is considered edible. Shanghai (沪菜 Hù Cài): because of its geographical location, Shanghai cuisine is considered to be a good mix of northern and southern Chinese cooking styles. The most famous dishes are xiaolongbao (小笼包 Xiǎolóngbāo) and chives dumplings (韭菜饺子 Jiǔcài Jiǎozi ). Sugar is often added to fried dishes giving Shanghainese food a sweet flavor. Sichuan (川菜 Chuān Cài): Famously hot and spicy. A popular saying is that it is so spicy your mouth will go numb. However, not all dishes are made with live chilis. The numbing sensation actually comes from the Sichuan peppercorn (花椒). It is widely available outside Sichuan and also native to Chongqing. If you want really authentic Sichuanese food outside Sichuan or Chongqing, look for small eateries sporting the characters for Sichuan cuisine in neighborhoods with lots of migrant workers. These tend to be much cheaper and often better than the ubiquitous up-market Sichuan restaurants. Hunan (湖南菜 Húnán Cài, 湘菜 Xiāng Cài): the cuisine of the Xiangjiang region, Dongting Lake and western Hunan Province. Similar, in some ways, to Sichuanese cuisine, it can actually be "spicier" in the Western sense. 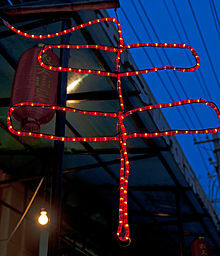 Teochew / Chaozhou (潮州菜 Cháozhōu Cài): originating from the Shantou area in northern Guangdong, a unique style which nonetheless will be familiar to most Southeast Asian and Hong Kong Chinese. Famous dishes include braised duck (卤鸭 Lǔyā), yam paste dessert (芋泥 Yùní) and fishballs (鱼丸 Yúwán). Fujian (福建菜 Fújiàn Cài, 闽菜 Mǐn Cài): uses ingredients mostly from coastal and estuarial waterways. "Buddha Jumps over a Wall" (佛跳墙 Fó Tiào Qiáng) is particularly famous. According to legend, the smell was so good a monk forgot his vegetarian vows and leaped over the wall to have some. Fujian cuisine can be split into at least two distinct cuisines: Minnan cuisine from the area around Xiamen and Mindong cuisine from the area around Fuzhou. Guizhou (贵州菜 Guìzhōu Cài, 黔菜 Qián Cài): combines elements of Sichuan and Xiang cuisine, making liberal use of spicy, peppery and sour flavors. The peculiar zhergen (折耳根 Zhē'ěrgēn), a regional root vegetable, adds an unmistakable sour-peppery flavor to many dishes. Minority dishes such as Sour Fish Hot Pot (酸汤鱼 Suān Tāng Yú) are widely enjoyed. Zhejiang (浙菜 Zhè Cài): includes the foods of Hangzhou, Ningbo, and Shaoxing. A delicately seasoned, light-tasting mix of seafood and vegetables often served in soup. Sometimes lightly sweetened or sometimes sweet and sour, Zhejiang dishes frequently involve cooked meats and vegetables in combination. Hainan (琼菜 Qióng Cài): famous among the Chinese, but still relatively unknown to foreigners, characterized by the heavy use of seafood. The signature specialties are the "Four Famous Dishes of Hainan" (海南四大名菜 Hǎi Nán Sì Dà Míng Cài): Wenchang chicken (文昌鸡 Wénchāng jī), Dongshan goat (东山羊 Dōngshān yáng), Jiaji duck (加积鸭 Jiājī yā) and Hele crab (和乐蟹 Hélè xiè). Wenchang chicken would eventually give rise to Hainanese chicken rice among the overseas Hainanese communities in Singapore and Malaysia. Meat, especially pork, is ubiquitous. Poultry such as duck and chicken are also popular, and there's no shortage of beef. Lamb and goat are popular with Muslims and in general in western China. If you know where to go, you can also sample more unusual meats like snake or dog. Rice is the archetypical staple food in southern China. Noodles are also an important staple, with wheat noodles (面, miàn) more common in northern China and rice noodles (粉, fěn) more common in the south. Vegetables are usually steamed, pickled, stir-fried or boiled. They're rarely eaten raw. Favorites include eggplant, Chinese cabbage (bok choy), pea shoots, water spinach, winter melon, lotus root, potato, daikon and bamboo shoots. Mushrooms – lots of different kinds. Tofu in China isn't just a substitute for vegetarians, but instead simply another kind of food, often served mixed with vegetables, meat, or eggs. It comes in lots of different forms, many of which will be totally unrecognizable if you're just used to the rectangular white blocks that are available internationally. Certain Chinese dishes contain ingredients some people may prefer to avoid, such as dog, snake or endangered species. However, it is very unlikely that you will order these dishes by a mistake. Dog and snake are usually served in specialty restaurants which do not hide their ingredients. Obviously, products made from endangered ingredients will have astronomical prices and would not be listed on the regular menu anyway. Generally speaking, rice is the main staple in the south, while wheat, mostly in the form of noodles, is the main staple in the north. Bread is hardly ubiquitous by comparison with European countries, but there is a lot of good flatbread in northern China, and bāozi (包子) (Cantonese: bao)—steamed buns stuffed with sweet or savory filling—are integral to Cantonese dim sum and popular elsewhere in the country as well. Buns without fillings are known as mántou (馒头/饅頭), and are a popular breakfast dish in northern China; these can be served either steamed or deep fried. Tibetan and Uyghur cuisines heavily feature flatbread that is similar to those in northern India and the Middle East. Except in some ethnic minority areas like Yunnan, Tibet, Inner Mongolia and Xinjiang, dairy products are not common in traditional Chinese cuisine. With globalization, dairy products are being incorporated into a few foods in the rest of the country, so you might see baozi stuffed with custard, for instance, but these remain exceptions. Dairy products also feature somewhat more commonly in the cuisines of Hong Kong, Macau and Taiwan than those of mainland China due to stronger Western influences. For strict vegetarians, China may be a challenge, especially if you can't communicate very well in Chinese. You may discover that your noodle soup was made with meat broth, your hot pot was cooked in the same broth as everyone else's, or your stir-fried eggplant has tiny chunks of meat mixed in. If you're a little flexible or speak some Chinese, though, that goes a long way. Vegetable and tofu dishes are plentiful in Chinese cuisine, though they sometimes have meat or dried shrimp mixed in, and noodles and rice are important staples. See also "Buddhist restaurants" below. A Lánzhōu lāmiàn restaurant in Shanghai. Notice the halal sign in the upper right. Lánzhōu lāmiàn (兰州拉面, Lánzhōu lāmiàn), fresh Lanzhou-style hand-pulled noodles. This industry is heavily dominated by members of the Hui (回族) ethnic group—look for a tiny restaurant with staff in Muslim dress, white fez-like hats on the men and head scarves on the women. If you're looking for halal food outside a Muslim-majority area, these restaurants are a good bet—many have signs advertising "halal" in Arabic (حلال). Mapo tofu (麻婆豆腐, mápó dòufu) – a Sichuanese tofu dish that is very spicy and has classic Sichuan málà tingly/numbing spiciness. Peking duck (北京烤鸭, Běijīng kǎoyā) – roast duck, probably the most famous dish characteristic of Beijing. Stinky tofu (臭豆腐, chòu dòufu) – just what it sounds like. Xiǎolóngbāo (小笼包) – small soup-filled dumplings from Shanghai, Jiangsu and Zhejiang. Barbecued sticks of meat (串 chuàn) from street vendors. Easy to spot since even the character looks like a kebab! Fiery Xinjiang-style lamb kebabs (羊肉串 yángròu chuàn) are particularly renowned. Jiānbǐng (煎饼), an egg pancake wrapped around a cracker with sauce and, optionally, chili sauce. Jiǎozi (饺子), which Chinese translate as "dumplings", boiled, steamed or fried ravioli-like items with a variety of fillings. These are found throughout Asia; momos, mandu, gyoza, and jiaozi are all basically variations of the same thing. Tofu pudding (豆花, dòuhuā; or 豆腐花, dòufuhuā) – in southern China, this soft pudding is usually sweet and can be served with toppings such as red beans or syrup. In northern China, it's savory, made with soy sauce, and is often called dòufunǎo (豆腐脑), literally "tofu brains". 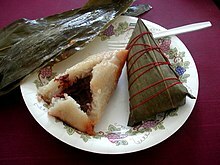 Zòngzi (粽子) – large sticky rice dumplings wrapped in bamboo leaves, traditionally eaten on the Dragon Boat Festival (Duanwu Festival) in May or June. On the Dragon Boat Festival, you may be able to find them for sale at shops that sell other kinds of dumplings and steamed buns, and it's possible you'll even see them at other times of year. The stuffing can be savory (咸的 xián de) with meat or eggs, or sweet (甜的 tián de). The savory ones are more popular in southern China, sweet in the north. You can also find various, usually sweet, items from the ubiquitous bakeries (面包店, miànbāodiàn). A great variety of sweets and sweet food found in China are often sold as snacks, rather than as a post-meal dessert course in restaurants as in the West. Dragon fruit (火龙果, huǒlóngguǒ) is a strange-looking fruit if you're unfamiliar with it, with pink skin, pink or green soft spikes poking out, white or red flesh, and black seeds. The kind with red flesh is sweeter and more expensive, but the white kind is tasty and refreshing too. Jujube (枣, zǎo), sometimes called the "Chinese date", presumably due to its size and shape, but its taste and texture are more like an apple. There are several different types, and you can buy them fresh or dried. Longan (龙眼, lóngyǎn, literally "dragon eye") is similar to the better-known lychee (below), but smaller, with a slightly lighter flavor and a smoother, pale yellow or brown peel. It's harvested in Southern China slightly later in the year than lychees. Lychee (荔枝, lìzhī) is a wonderfully sweet, juicy fruit with a somewhat perfumy taste, and at its best when its peel is red. It is harvested in the late spring and early summer in areas of Southern China such as Guangdong Province. Mangosteen (山竹, shānzhú), a dark purple fruit the size of a small apple. To eat it, squeeze it from the bottom until the thick peel cracks, then open it and eat the sweet white flesh. Watermelon (西瓜, xīguā) is very commonly available in the summertime. Chinese watermelons tend to be spherical, rather than elongated in one dimension. Tea (茶, chá) can of course be found at restaurants and at dedicated tea houses. In addition to the more traditional "neat" tea without milk or sugar, bubble tea with milk and tapioca balls (served hot or cold) is popular, and you can find bottled sweet iced tea in stores and vending machines. For more information, see China#Tea. Soymilk (豆浆, dòujiāng) – different from the stuff that's known as "soymilk" in Europe or the Americas. You can find it at some street food stalls and restaurants. The server may ask if you want it hot (热 rè) or cold (冷 lěng); otherwise the default is hot. Báijiǔ in a glass and in a bottle. 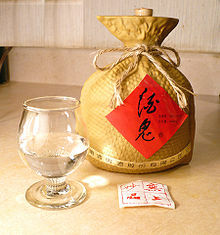 Báijiǔ (白酒) is very strong, clear grain liquor. Like other liquors that are better known in the West, its quality ranges from utter rotgut to refined, and its price ranges accordingly. Beer (啤酒, píjiŭ) is widely available in China, especially the north. The best-known brand in the West is Tsingtao, which is from the city of Qingdao (Tsingtao being the transliteration of the city's name in the old Wade-Giles Romanization), but there are others. Many restaurants in China charge a cover charge of a few yuan per person. Yelp is virtually unknown in China, while the Michelin Guide only covers Shanghai and Guangzhou, and is not taken very seriously by most Chinese people. Instead, most Chinese people rely on local website Dazhong Dianping for restaurant reviews and ratings. While it is a somewhat reliable way to search for good restaurants in your area, the downside is that it is only in Chinese. Hot pot restaurants are popular in China. The way they work varies a bit, but in general you choose, buffet-style, from a selection of vegetables, meat, tofu, noodles, etc., and they cook what you chose into a soup or stew. These restaurants can be a good option for travellers who don't speak Chinese, though the phrases là (辣, "spicy"), bú là (不辣, "not spicy") and wēilà (微辣, "mildly spicy") may come in handy. You can identify many hot pot places from the racks of vegetables and meat waiting next to a stack of large bowls and tongs used to select them. 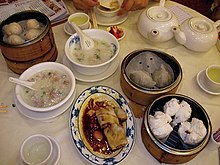 Cantonese cuisine is known internationally for dim sum (点心, diǎnxīn), a style of meal served at breakfast or lunch where a bunch of small dishes are served in baskets or plates. At a dim sum restaurant, the servers may bring out the dishes and show them around so you can select whatever looks good to you or you may instead be given a checkable list of dishes and a pen or pencil for checking the ones you want to order. As a general rule, Cantonese diners always order shrimp dumplings (虾饺, xiājiǎo in Mandarin, hāgáau in Cantonese) and pork dumplings (烧卖, shāomài in Mandarin, sīumáai in Cantonese) whenever they eat dim sum, even though they may vary the other dishes. This is because the two aforementioned dishes are considered to be so simple to make that all restaurants should be able to make them, and any restaurant that cannot make them well will probably not make the other more complex dishes well. Moreover, because they require minimal seasoning, it is believed that eating these two dishes will allow you to gauge the freshness of the restaurant's seafood and meat. Big cities and places with big Buddhist temples often have Buddhist restaurants serving unique and delicious all-vegetarian food, certainly worth trying even if you love meat. Western-style fast food has become popular. KFC (肯德基), McDonald's (麦当劳), Subway (赛百味) and Pizza Hut (必胜客) are ubiquitous, at least in mid-sized cities and above. There are a few Burger Kings (汉堡王), Domino's and Papa John's (棒约翰) as well but only in major cities. (The menu is of course adjusted to suit Chinese tastes.) Chinese chains are also widespread. These include Dicos (德克士)—chicken burgers, fries etc., cheaper than KFC and some say better—and Kung Fu (真功夫)—which has a more Chinese menu. Chinese restaurants often offer an overwhelming variety of dishes. Fortunately, most restaurants have picture menus with photos of each dish, so you are saved from despair facing a sea of characters. Starting from mid-range restaurants, there is also likely to be a more or less helpful English menu. Even with the pictures, the sheer amount of dishes can be overwhelming and their nature difficult to make out, so it is often useful to ask the waiter to recommend (推荐 tuījiàn) something. They will often do so on their own if they find you searching for a few minutes. The waiter will usually keep standing next to your table while you peruse the menu, so do not be unnerved by that. The two-menu system where different menus are presented according to the skin color of a guest remains largely unheard of in China. Most restaurants only have one menu—the Chinese one. Learning some Chinese characters such as beef (牛), pork (猪), chicken (鸡), fish (鱼), stir-fried (炒), deep-fried (炸), braised (烧), baked or grilled (烤), soup (汤), rice (饭), or noodles (面) will take you a long way. As pork is the most common meat in Chinese cuisine, where a dish simply lists "meat" (肉), assume it is pork. Dishes ordered in a restaurant are meant for sharing amongst the whole party. If one person is treating the rest, they usually take the initiative and order for everyone. In other cases, everyone in the party may recommend a dish. If you are with Chinese people, it is good manners to let them choose, but also fine to let them know your preferences. If you are picking the dishes, the first question to consider is whether you want rice. Usually you do, because it helps to keep your bill manageable. However, real luxury lies in omitting the rice, and it can also be nice when you want to sample a lot of the dishes. Rice must usually be ordered separately and won’t be served if you don’t order it. It is not free but very cheap, just a few yuan a bowl. For the dishes, if you are eating rice, the rule of thumb is to order at least as many dishes as there are people. Serving sizes differ from restaurant to restaurant. You can never go wrong with an extra plate of green vegetables; after that, use your judgment, look what other people are getting, or ask the waiter how big the servings are. If you are not eating rice, add dishes accordingly. If you are unsure, you can ask the waiter if they think you ordered enough (你觉得够吗? nǐ juéde gòu ma?). You can order dishes simply by pointing at them in the menu, saying “this one” (这个 zhè ge). The way to order rice is to say how many bowls of rice you want (usually one per person): X碗米饭 (X wǎn mǐfàn), where X is yì, liǎng, sān, sì, etc. The waiter will repeat your order for your confirmation. If you want to leave, call the waiter by shouting 服务员 (fúwùyuán), and ask for the bill (买单 mǎidān). Chinese-style fast food chains provide a good option for the lone traveller to get filled, and still eat Chinese style instead of western burgers. They usually have picture menus or picture displays above the counter, and offer set deals (套餐 tàocān) that are designed for eating alone. Usually, you receive a number, which is called out (in Chinese) when your dish is ready. Just wait at the area where the food is handed out – there will be a receipt or something on your tray stating your number. The price you pay for this convenience is that ingredients are not particularly fresh. It’s impossible to list all of the chains, and there is some regional variation, but you will generally recognize a store by a colourful, branded signboard. If you can’t find any, look around major train stations or in shopping areas. Department stores and shopping malls also generally have chain restaurants. A tastier and cheaper way of eating on your own is street food, but exercise some caution regarding hygiene and be aware that the quality of the ingredients (especially meat) may be suspect. Ask around and check the local wiki page to find out where to get street food in your city; often, there are snack streets or night markets full of stalls. Another food that can be consumed solo are noodle soups such as beef noodles (牛肉面 niúròumiàn), a dish that is ubiquitous in China and can also be found at many chain stores. Even if it may be unusual to eat at a restaurant alone, you will not be thrown out and the staff will certainly try to suggest something for you. There's a stereotype that Chinese cuisine has no taboos and Chinese people will eat anything that moves, but a more accurate description is that food taboos vary by region, and people from one part of China may be grossed out by something that people in another province eat. Cantonese cuisine in particular has a reputation for including all sorts of animal species, including those considered exotic in most other countries or other parts of China. That said, the cuisine of Hong Kong and Macau, while also Cantonese, has somewhat more taboos than its mainland Chinese counterpart as a result of stronger Western influences; dog and cat meat, for instance, are illegal in Hong Kong and Macau. In Muslim communities, pork and alcohol are taboo. Table manners vary greatly depending on social class, but in general, while speaking loudly is common in cheap streetside eateries, guests are generally expected to behave in a more reserved manner when dining in more upmarket establishments. When eating in a group setting, it is generally impolite to pick up your utensils before the oldest or most senior person at the table has started eating. Communal chopsticks (公筷) are not always provided, so diners typically use their own chopsticks to transfer food to their bowl. While many foreigners consider this unhygienic, it is usually safe. It is acceptable to request communal chopsticks from the restaurant, although you may offend your host if you have been invited out. Once you pick a piece, you are obliged to take it. Don't put it back. Confucius says never leave someone with what you don't want. When someone is picking from a dish, don't try to cross over or go underneath their arms to pick from a dish further away. Wait until they finish picking. In most cases, a dish is not supposed to be picked simultaneously by more than one person. Don't try to compete with anyone to pick a piece from the same dish. Don't put your chopsticks vertically into your bowl of rice as it is reminiscent of incense sticks burning at the temple and carries the connotation of wishing death for those around you. Instead, place it across your bowl or on the chopstick rest, if provided. Don't drum your bowl with chopsticks. Only beggars do it. People don't find it funny even if you're willing to satirically call yourself a beggar. Likewise, don't repeatedly tap your chopsticks against each other. Many travel books suggest that cleaning your plate suggests that your host did not to feed you well and will feel pressured to order more food. Actually this varies regionally, and in general, finishing a meal involves a delicate balance. Cleaning your plate will typically invite more to be served, while leaving too much may be a sign that you didn't like it. Especially when dining in a family setting, do not start eating until the oldest person at the table has started. All dishes are shared, similar to "family style" dining in North America. When you order anything, it's not just for you, it's for everyone. You're expected to consult others before you order a dish. You will usually be asked if there is anything you don't eat, although being overly picky is seen as annoying. Serve others before yourself, when it comes to things like rice and beverages that need to be served to everyone. If you want to serve yourself a second helping of rice, for instance, check first to see if anyone else is running low and offer to serve them first. Making slurping noises when eating is common but could be considered inappropriate, especially among well educated families. However, slurping, like "cupping" when tasting tea, is seen by some gourmets as a way to enhance flavor. It is normal for your host or hostess to put food on your plate. It is a gesture of kindness and hospitality. If you wish to decline, do it in a way so that it does not offend. For example, you should insist that they eat and that you serve yourself. Spoons are used when drinking soups or eating thin or watery dishes such as porridge, and sometimes to serve from a serving dish. Finger foods are uncommon at restaurants; in general you're expected to eat with chopsticks and/or a spoon. For the rare foods that you are supposed to eat with your hands, disposable plastic gloves may be provided. If a piece is too slippery to take, do it with the aid of a spoon; do not spear it with the sharp end of the chopstick(s). Fish heads are considered a delicacy and may be offered to you as an honored guest. In truth, the cheek meat in some species of fish is particularly savory. In China, restaurants and pubs are very common entertainment places and treating plays an important part in socializing. While splitting the bill is beginning to be accepted by young people, treating is still the norm, especially when the parties are in obviously different social classes. Men are expected to treat women, elders to juniors, rich to poor, hosts to guests, working class to non-income class (students). Friends of the same class will usually prefer to split the opportunity to pay, rather than split the bill, i.e. "This is my turn, and you treat next time." It is common to see Chinese competing intensely to pay the bill. You are expected to fight back and say "It's my turn, you treat me next time." The smiling loser will accuse the winner of being too courteous. All these dramas, despite still being common among all generations and usually played wholeheartedly are becoming somewhat less widely practiced among younger, urban Chinese. Whenever you dine with Chinese then you will have fair chances of being treated. For budget travellers, the good news is that Chinese tend to be eager to treat foreigners, although you shouldn't expect much from students and grassroots working-class. That being said, Chinese tend to be very tolerant towards foreigners. If you feel like going Dutch, try it. They tend to believe that "all foreigners prefer to go Dutch". If they try to argue, it usually means that they insist on paying for your bill as well, not the opposite. This travel topic about Chinese cuisine is a usable article. It touches on all the major areas of the topic. An adventurous person could use this article, but please feel free to improve it by editing the page. This travel guide page was last edited at 13:15, on 14 April 2019 by Wikivoyage user Mx. Granger. Based on work by Wikivoyage users The dog2, Koavf, Mbrickn, Ikan Kekek, SelfieCity, 夢蝶葬花, Yvwv and The wiki vandel from Guangzhou.